Witness the beauty of the Torres del Paine National Park on this full-day tour from Puerto Natales, including hotel pick-up. Keep your camera ready as you pass an ever-changing landscape of glittering lakes, lagoons and glaciers, framed by dramatic, snow-capped peaks. 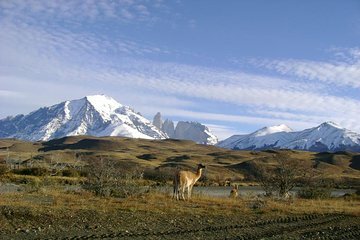 Embark on a short hike to the Salto Grande and Grey Glacier; see the Laguna Amarga; and keep a lookout for native wildlife like guanacos, rheas and condors.